Hey guys! So, I hadn't won any giveaways in quite some time...I hadn't been entering a lot either. On a whim, I entered this one from my friend Niki over at Hello Miss Niki. Turns out, I won! 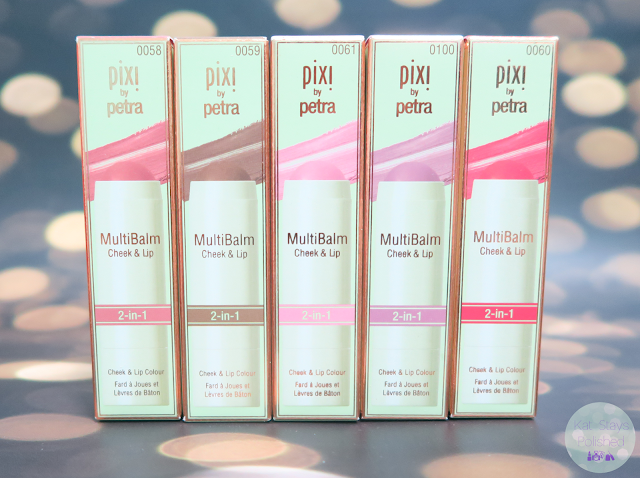 I was super excited about it too because her post about these Cheek & Lip MultiBalms had me wanting more. There are 5 shades to choose from and they are all sheer enough for anyone to use - though I'm not sure if I could use Sheer Sculpt on my lips. I think that one will stay a cheek product for me. Every last one of these applied extremely well - so smooth and with so much ease. Because these are balms, i didn't expect a super big color payoff but just look at these swatches! It's amazing! I'm an addict for life now! If you want these for yourself, you can find them on the Pixi Beauty website or find them at a local store near you! They look really nice and its great to see that there pretty pigmented too. I think they are adorable! Good luck to those who enter! I love these. Congrats on your win. I'm always pulling out one of these to use as blush. Those look so nice! The shades are so wearable and pretty.